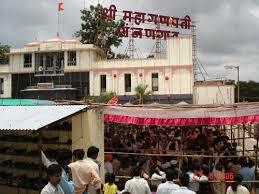 Here is Some Information about Mahaganapati Temple in Ranjangaon Maharashtra India. Nearest Railway Station: Uruli station(16 Kms). Nearest Airport: Pune Airport(50 Kms). 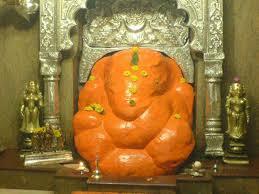 The Mahaganapati Ashtavinayaka Temple is located at Ranjangaon Maharashtra India.This temple is among one of Ashtavinayaka Temple in Maharashtra.The temple was built in about 9th & 10th century and built by Madhavrao Peshwa made a room in the basement of the temple to keep the idol of the lord Ganesha.The temple is dedicated to Lord Ganesha.The cute idol of Lord Ganesh is also named as 'Mahotkat'; portrayed on a lotus, flanked by his consorts Riddhi and Siddhi. It is said that,original idol of Mahaganapati is hidden in a cellar in the basement. It is also said that it has 10 trunks & 20 hands. Meditating on that idol is callaed Mahaganapati Dhyan.That idol is not taken out usually. Due to fear of muslim invasion, in good old days that idol was hidden. That Ganesha is called Mahotkata. However,temple trustees has refused existence of such an idol in the cellar.Outside the temple, there is small market, offering prasad, garlands, coconuts and other holy offerings for Mahaganpati.The temple is quite crowded on weekends and holy festivals, and you may have to wait for more than 30 mins for paying a visit. One also has an option of fast darshan by paying INR 50; however, the local villagers are previleged for having a direct entry to the main temple. There are a few colorful paintings on the walls depicting stories of Indian Gods & Goddesses. 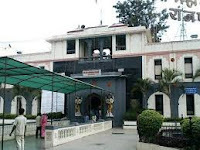 According to the history the Mahaganapati temple was build in between 9th & 10th century. A room in the basement of the temple to keep the idol of the lord Ganesh which is made by Madhavrao Peshwa. Later it renovated on Sardar Kibe of Indore. Nagarkhana is situated above the entrance gate. Main temple looks like temple from Peshwa’s period. Temple facing east has huge & beautiful entrance gate.Peshwa's Senapati (commander of Army) Haripant Phadke came to Siddhivinayaka on loosing his designation. He performed 21 days Anushthan (ceremony to propitiate God). Accordingly he vowed to circumnavigate Shree Siddhivinayaka 21 times in a day continously for 21 days. Exactly on 21 st day Peshwa's messenger came to Siddhatek and took Haripant Phadke to Pune honourably.The place where Sage Bhrushandi had performed penances is nearer to the temple. The main temple looks like temples from the Peshwa period. Temple is so constructed that sun rays fall directly on Shree Ganesha's idol. Since, this temple was on his way while going for war, Shreemant Madhavrao Peshwa used to halt here & have Mahaganapati's darshan.The temple contains the foot wear of Shri Vengaonkar Josh, the great devotee of Lord Ganesha and the gateway of the temple has a bright lamp tower. The stone pillars of the old temple can be seen in the compound. This architecture bears similarity to the architecture of the 9th & 10th century. With prior intimation, the temple trust also makes arrangements to send the prasad to you. 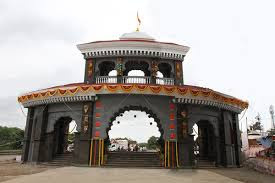 By Road : There are many public and private vehecals available to reach Mahaganapati Ashtavinayaka Temple in Ranjangaon Maharashtra. By Rail : The Nearest Railway station is Uruli station(16 Kms). By Air : The Nearest Airport is Pune Airport.